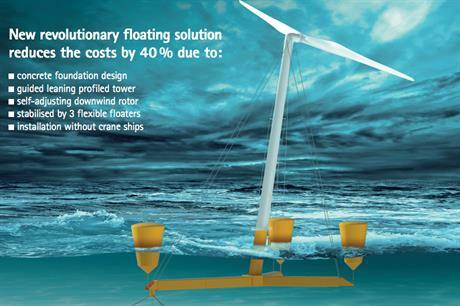 GERMANY: Aerodyn has unveiled an integrated floating platform and turbine design it claims can reduce offshore wind costs by 40%. The new platform, called the SCD Nezzy, uses Aerodyn's 8MW two-bladed downwind turbine joined to a concrete platform with three floating cups. It can be entirely constructed onshore before being towed out to the project site. The downwind two-bladed design allows it to be self-adjusting, removing the need for yaw. Speaking at WindEnergy Hamburg, Aerodyn president Soenke Siegfriedsen told Windpower TV that it was an "interesting design". "At first, I was a little surprised about my ideas, but at the end we know it can work." he said. The platform, which sits under the water, has been designed in a y-shape, using concrete pre-stressed tubes. "On this y-shaped concrete part a profile tower is erected that is also fixed by steel ropes that are pre-tensioned so that the forces coming from the rotor can be directly transferred over the steel ropes inside the anchors in the water," explained Siegfriedsen. "That makes the design very unique, we have made a lot of investigations already." According to Siegfriedsen, the design could lead to major cost reductions in manufacturing and installation. "After our calculations, compared with a jacket design for 40-metre water depths, we can reduce the cost for the hardware itself by 40-45%. Also, for this floating foundation we do not need installation ships."